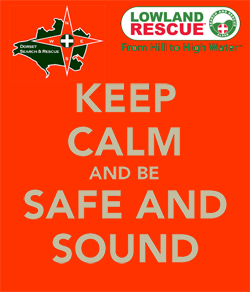 Dorset Search and Rescue (DorSAR) does not only focus on reactive Lowland Rescue. Most of us have grown up with the teaching "Prevention is Better that Cure" and with this in mind is active in promoting these preventative measures. To date our long standing initiative focused on our young people "Get Found" has encouraged children of all ages with their parents to take some time considering what they could/would do in the event that they become lost. To add to this we have launched our "Safe and Sound" campaign. Aimed at carers who look after vulnerable people of any age, but who may go missing or get lost. The hub of the campaign being the "Life History Questionnaire" which recordâ€™s a range of background information about the person cared for, and is retained by the carer, so that if their loved one does go missing, key information required by the Police and volunteer search teams is easily to hand, and will aid in finding them.